I made this card with scraps I had in my stash. This is a very simple card. I used my Stampin' Up! 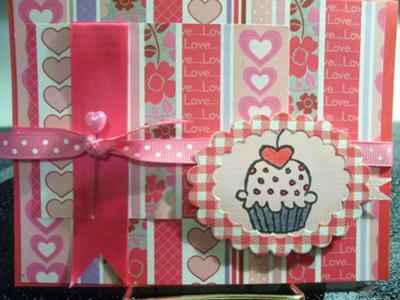 card stock deep pink paper.I glued a pretty printed paper over the deep pink card stock, and added a deep pink ribbon and then across the center I added a thin polka dot ribbon and put a pretty pink heart shaped stick pin through it. Then used my spellbinder small oval, cutting my scalloped edge, putting my stamped cupcake with the little heart on the top,in the center of it. I colored in the cup cake, I then put them in place with pop dots. I made this card for our Granddaughter Gracie. THIS CARD FOR THE WIN!